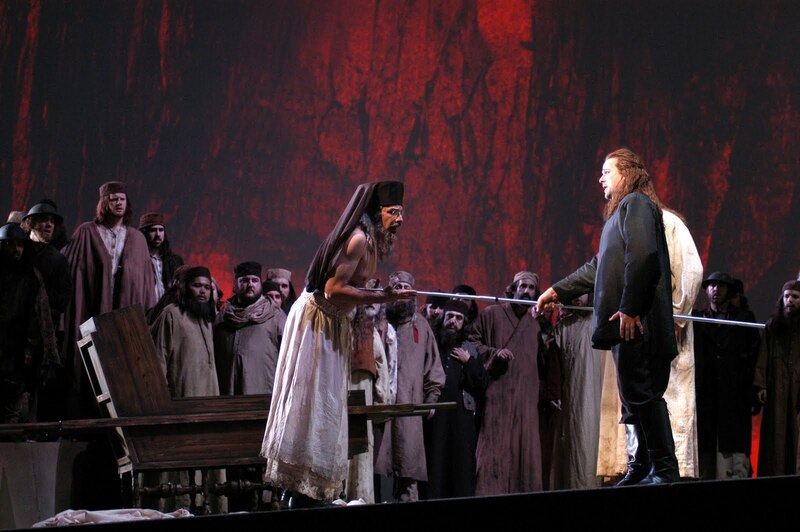 Another potent symbol in Wagner’s Tristan und Isolde is the wound, die Wunde. Wounds are always big deals in Arthurian legends; Wagner returned to the image of the wounded, languishing hero who magically can neither recover his health nor die for his final opera, Parsifal, where Amfortas (Wagner once said) “experiences the agony of Tristan inconceivably intensified.” For Wagner himself, who suffered from serious health disorders his entire life, a character languishing in ill health was both a real-life experience he knew all too well and a metaphor for the human condition in our alienated modern age. 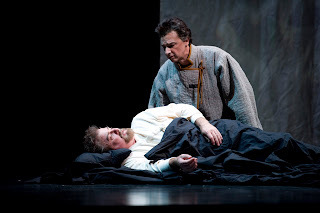 In Seattle Opera's 2003 Parsifal, also designed by Robert Israel, Chris Ventris as Parsifal heals Greer Grimsley as Amfortas's wound by touching it with the spear that caused the wound originally. If you study the plot of Tristan carefully, you’ll find that Tristan gets wounded twice: first by Morold, then by Melot. Morold, aka Mr. Not-Appearing-In-This-Opera, was (in the backstory) an Irish giant and Isolde’s fiancé. 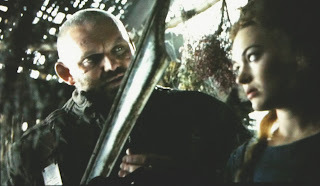 (Below, Graham Mullins as Morold comes on to Sophia Myles as Isolde in the 2006 film based on the old legend.) Morold used to come to Cornwall to push King Marke around, and when Tristan was finally old enough to stand up to him he fought Morold, chopped off his head, and sent it back to Ireland, with a piece of his own sword that had chipped off still lodged in it. But Tristan was wounded in his fight with Morold (right, from the same 2006 film, Sophia Myles as Isolde tends James Franco as Tristan). In Wagner's version, since Isolde was famed as a healer, Tristan disguised himself (taking the name “Tantris”) and got her to heal his wound--and she only figured out who he really was when she took the sword fragment out of Morold’s head and noticed how perfectly it fit in the notch in her patient Tantris’s sword. Wagner uses a melody that droops downwards, chromatically (a traditional signifier, in Western music, for death) in Act One whenever they’re talking about this “Morold” wound. Greer Grimsley as Kurwenal cares for the wounded, delirious Clifton Forbis as Tristan in Seattle Opera's current production (Rozarii Lynch photo). riß mit dem Schwert sie wieder los. the [English horn] melody sounded its yearning lament. and pushed me toward Ireland’s maid. the wound she had healed. But the sword—she let it fall. She gave me the death potion to drink. that eternal torment should be mine! Heia, mein Blut! Lustig nun fließe! Hey, my blood! Flow now, be free! she comes to heal me! as I rush toward her! 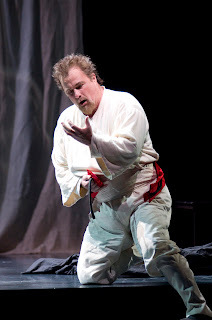 Clifton Forbis as Tristan rips off his bandage (Rozarii Lynch photo). When it’s her turn, a few minutes later, Isolde will die a very different death.